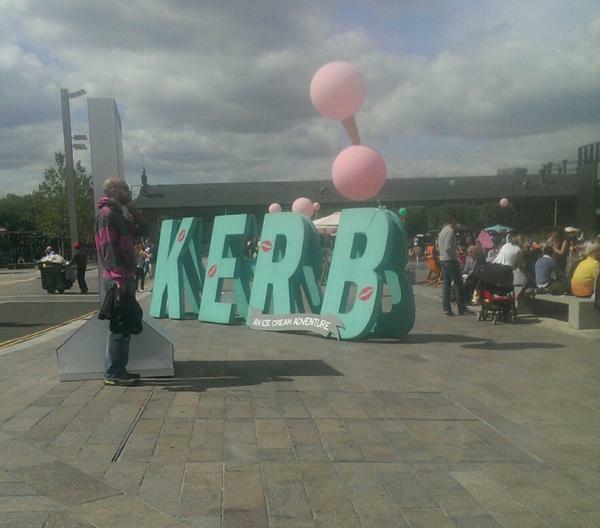 The street food market KERB KX is back with a twist: An Ice Cream Adventure! Every Saturday till 20th September is going to bring 12 ice cream and lolly phenomenons to Granary Square, along with a handful of food and dessert stalls of the likes of Bill & Beak, Kimchinary, Grilling Greek, & Bleecker St. Burger – a pretty bloody decent bunch, if you ask me. Today’s review will limit itself to must-try ice cream stalls, because there’s only so much double creamy goodness you can consume in one day (BUT, there are vegan options at the venue!). Although the Hoodooist wished he could, couldn’t manage to eat a proper lunch, because the ice creams and cocktails were more than enough to satiate him at this point. Starting with The Manhattan Project’s Asian Bloody Mary – Stoli, Tomato, Wasabi, Calamansi, Soy, Sriracha, Fermented Chilli – a spectacular combo since Bloody Marys have not usually been the Hoodooist’s first choice. We made our way to the excellent Ruby Violet, whose horseradish ice cream we then added to the Bloody Mary for a wonderful extra kick. At first I certainly wasn’t sure, but was happily surprised at how well it worked! The horseradish ice cream isn’t the sweetest, so doesn’t throw off the flavour of the Bloody Mary, worth a shot if you’re feeling adventurous. On that note, props to Ruby Violet for the adventurousness of a horseradish ice cream! Sorbitium Ices (from the previous Street Feast reviews – Click for Hackney, Dalston Yard & Lewisham, you know they’re an old favourite), knocked it out of the park with their Olive Oil, Pine Nut & Candied Orange ice cream. I preferred it at the Hackney Street Feast without the candied orange, but it didn’t hurt! Other great combos like the Dark Chocolate & Whisky (bit intense on the whisky), and Strawberry Balsamic ruled the menu, whereas the Melon, Cucumber, Buttermilk & Chilli was a nice tangy choice. I walked up to Drunken Dairy a bit wary, but was pleasantly surprised but the lovely Dark Destroyer: Dark Chocolate & Grand Marnier, definitely stood out in the massive barrage of orange flavours all the stalls put forward. Similarly surprised was I by Jolly Nice’s savoury Plum & Star Anise – couldn’t have too much of it, but was a spectacular production! The depth provided by the anise was incredible – absolutely necessary to try. Finally, one that definitely stood out, and though I am choosing no winners today, but a painfully high ranker: La Gelatiera’s Porcini Mushroom & Chocolate Cream. Don’t ask me by what sorcery or defiance in the laws of physics that this works: but it does. And it does so with confidence and humble panache. The earthy porcini complements the chocolate, and does so with strong flavour, but without overpowering it, blowing La Gelatiera’s other ambitious flavours like Basil & Chilli out of the water. This entry was posted in Bars & Cocktails, Festivals & Events, Gastronomy and tagged Event, Food, Ice Cream, KERB, Street Food, Summer.